Oracle APEX Builder Plugin v1.9 release! The Oracle APEX Builder Plugin is a productivity and usability enhancement tool for the development environment of Oracle Application Express (APEX). It integrates with Firefox and Internet Explorer 6 & 7 to put a wealth of new features to your favorite development tool. The good news is, it’s Open Source and you can use it for free! If you haven’t heard about it yet, have a look at the newly designed project homepage to read about all the enhancements it adds to the Oracle APEX Builder! Split “Display As” select list for page items. Quick Pick Links for Report Column “Display As” select list. Resizable Textareas can now store the size. Anchor Highlighting has been enhanced to do the highlighting for “Conditions”, “Security” and “Build Option”, too. The different features can now be enabled and disabled. Thanks to Chris for fixing a problem with Keyboard shortcuts. A detail list of changes can be found in the Change Log. What else has changed? The APEX Builder Plugin now has it’s own domain builderplugin.oracleapex.info and I totally redid the documentation and the installation process to make it even simpler. I would appreciate it if a native speaker could have a look and send me corrections for grammar and spelling errors. Thanks a lot! BTW, you can now also subscribe to the APEX Builder Plugin RSS Feed. 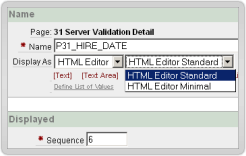 This entry was posted in Oracle APEX Builder Plugin by Patrick Wolf. Bookmark the permalink.